Dianne Hofmeyr recounts the true story about a giraffe that was given from the ruler of Egypt to “my friend, the King of France,” in 1827. The giraffe’s remarkable journey from the “plains of Africa” to the Jardin des Plantes in Paris is a bittersweet tale with a poignant ending. An unweaned giraffe, not yet able to walk, is snatched by hunters and transported by camel to the Great Pasha of Egypt and Sudan. 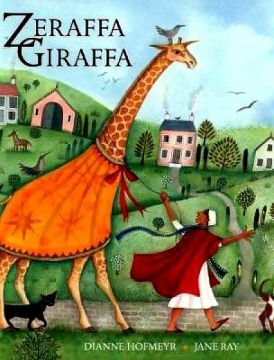 The delighted ruler dispatches the giraffe with his servant, Atir, to be her keeper on a two-and-a-half-year trek by boat down the Nile River, across the Mediterranean Sea to Marseilles. From there, Atir and the giraffe he named Zeraffa walked 550 miles to Paris to the amazement of the French populace along the route, who had never seen such a creature before. A special building becomes Zeraffa’s permanent home, and she is the sensation of French society and inspiration for everything from women’s hairstyles to dogs’ spotted jackets and garden hedges clipped in giraffe shapes. Through it all, Atir remains selflessly and faithfully with Zeraffa for the rest of her eighteen-year life in Paris, keeping alive memories of Africa’s land and climate. Ultimately, this is a story about displacement and longing. Hofmeyr’s lyrical text reads like free verse poetry in places, particularly in describing the journey down the Nile: “…past the silent giraffe paintings…past the lion-faced Sphinx…past ladies combing their hair…to the place where the sea sipped up the Nile.” Or the walk from Marseilles to Paris: “through orchards…through fields of red poppies…through vineyards…” There is natural humor in the absurdity of proposals for how to transport Zeraffa on the walk across France and in ridiculous ways the French people exhibited their love affair with the giraffe, from baking giraffe biscuits to wearing false (giraffe-like) eyelashes. Positive themes are clearly demonstrated in Atir’s loyalty, affection, and tenderness toward Zeraffa, his sacrifice in giving so many years of his life to her care, and his admirable common sense in proposing the solution of walking to Paris. More sobering issues also underlie the narrative, however: the cruelty of removing a helpless wild animal from its mother and arrogance of treating another creature of nature so callously, the manner in which the giraffe is regarded with such exoticism and becomes an object to be confined for the viewing pleasure of “civilized” people. An afterword provides more context and background for the facts of the story, but left unanswered is the reason why the Egyptian ruler would want to make friends with the French king—presumably, he may have had something to gain, and not simply for the sake of pure friendship. These latter themes can stimulate thoughtful, critical discussions about power and dominance. British illustrator Jane Ray’s beautifully rendered watercolor illustrations evoke the diverse settings well from the spare African savannah to the lush French countryside. Delicate lines add details and features to the landscapes, people, and objects depicted. She has illustrated more than thirty books with various authors and ones she has written—many fairy tale retellings. Both author and illustrator are critically acclaimed, with Hofmeyr writing stories about many different locations across the African continent, from her native South Africa to ancient Great Zimbabwe, Egypt, and St. Helena island off the coast of Africa. A multi-talented writer, she has collaborated with other illustrators such as Piet Grobler and Jude Daly for picture books and authored novels for more mature readers, most recently the adventurous Oliver Strange series.Recommended.